Chocolate lovers, rejoice! 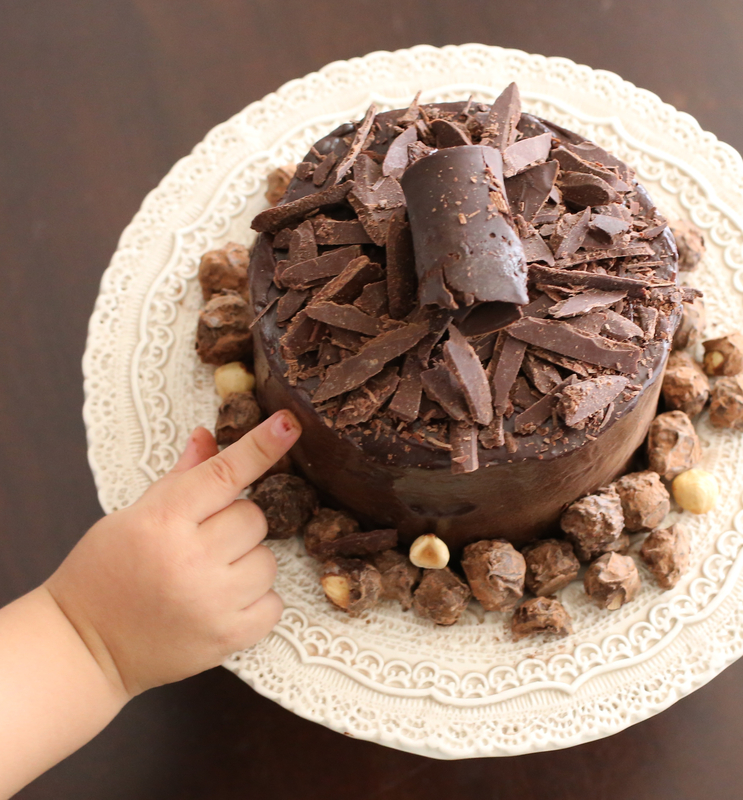 This cake is loaded with chocolate! This chocolate cake has often been the climax of many special evening meals I’ve shared with family and friends. It’s lusciously coated with two layers of a decadent ganache and topped with a mountain of semisweet chocolate curls! 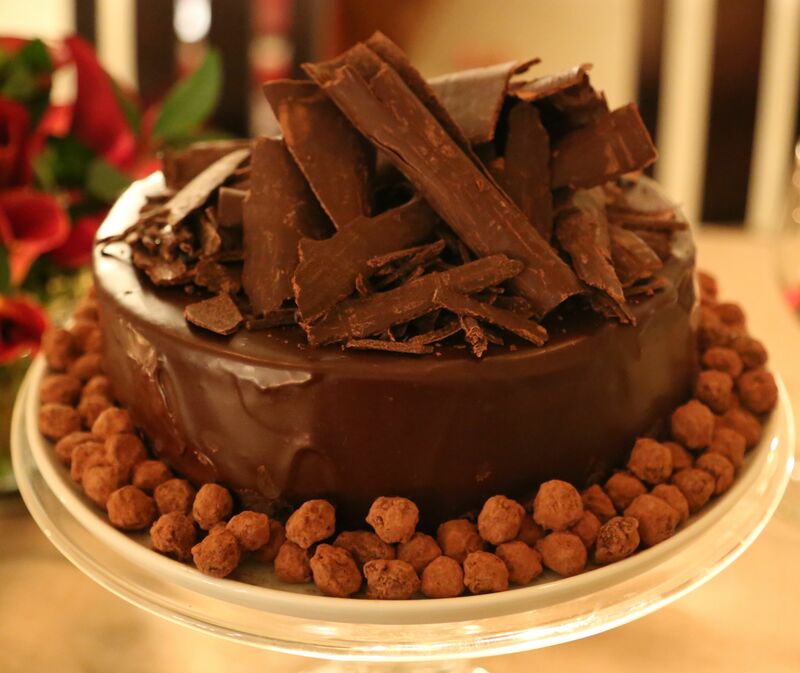 To take you to the dreamy land of chocolate-hazelnut bliss, the cake is garnished with candied hazelnuts that are coated in more chocolate and then rolled in cocoa powder. It’s nothing short of amazing?! You’re going to LOVE it! Preheat oven to 350 degrees Fahrenheit. Place nuts on a baking sheet. Bake until fragrant and toasted, about 12 minutes. Transfer to a clean kitchen towel; rub to loosen skins. Butter a 9- by 3-inch springform pan well; coat with cocoa, tapping out any excess. Alternatively, you could pour the batter into several smaller size pans. In a food processor, grind nuts with granulated sugar until fine but not pasty; transfer to a large bowl; stir in the flour, baking soda, and salt. In a heat-proof bowl, whisk together cocoa and boiling water until smooth. (Mixture will thicken as it cools). In a bowl of an electric mixer, cream butter and brown sugar on high until lightened and fluffy, 3 to 4 minutes. Beat in eggs one at a time until well blended. Stir in buttermilk and vanilla, into cocoa mixture. Mixing on low, add half of dry ingredients to creamed mixture; when blended, pour in the cocoa mixture, and add remaining dry mixture, mixing just until incorporated. Scrape batter into prepared pan, smooth top. Bake one hour to one hour and 10 minutes, until a tester inserted in the center comes out clean. Let cool in pan for 10 minutes; remove from pan and cool completely. Place cooled cake on a 9-inch cardboard round. Place half of the ganache (recipe below) in a bowl; place bowl in a larger bowl of ice water; whip with a balloon whisk until lighter in color and spreadable, removing bowl from ice bath and returning it as necessary. Spread the whipped gananche smoothly on top and on sides of the cooled cake, and chill the cake. Gently stir remaining ganache every five minutes until thickened and cool. Place cake (still on cardboard round) on a wire rack over a sheet of waxed or parchment paper. Working with a small ladle, pour ganache over top of cake, letting the ganache run down sides. Scrape up excess and reserve for another use. Let cake stand at room temperature until set. Garnish with nuts and chocolate curls. Place chopped chocolate in a large heat-proof bowl. Bring cream to a boil over medium-high heat; pour directly over chopped chocolate. Allow to sit about 10 minutes. Use a rubber spatula to gently stir chocolate and cream until well combined and smooth. Let sit at room temperature until cooled and just thickened, stirring occasionally, about 30 minutes, but up to an hour depending on the temperature of the room. This ganache thickens as it sits. Your ganache should be pourable, but still thick enough to fully coat the cake. Preheat oven to 350 degrees Fahrenheit. Place nuts on a baking sheet. Bake until fragrant and toasted, about 12 minutes. Transfer to a clean kitchen towel; rub to loosen skins. Place sugar and water in a medium heavy skillet. Stir with a fork over medium-high heat until dissolved; let boil undisturbed for about 3 minutes. Add nuts to pan; stir with wooden spoon until caramel seizes around nuts. Transfer to a parchment-lined shallow baking sheet; allow to cool. Once nuts are cool, place half of chopped chocolate in a deep medium size stainless-steel bowl. Place bowl over a saucepan with 1-inch of simmering water; stir until chocolate is melted and hot. Add remaining chocolate to bowl, remove bowl from pan of water, let stand about 5 minutes, then stir until smooth. Pour half of the chocolate onto an inverted baking sheet; spread with a bench scraper until 1/8-inch thick or slightly thinner (chocolate should be opaque on surface). Let stand until just tacky; Hold scraper at a 45 degree angle; scrap chocolate off surface. Store curls at room temperature in an airtight container layered with parchment. While chocolate sets, add candied nuts to remaining chocolate in a bowl, and stir until coated. Spread nuts on a parchment lined baking sheet, and let stand until set. Sift cocoa powder on top of dried nuts and toss to coat. Store in a resealable plastic bag for up to one week, until ready to use. Notes: To save time, you can toast and peel the nuts for the cake and the garnish at the same time. This car can be baked up to three days in advance; wrap well and keep at room temperature. The candied hazelnuts and chocolate curls can also be made three days in advance; store in airtight container. However, they can get a bit dry if made too far in advance. Also, I’ve made the mistake of putting my chocolate curls in the refrigerator after putting them in an airtight container. That can dry them out too. I heard you can slightly and carefully steam your chocolate if the curls get a it dry, but I have not yet tried this trick. I sometimes use a mix of bittersweet and semisweet chocolate. Finally, a bench scraper is a must. The first time I made this cake many, many years ago, I did not have a bench scraper and my chocolate curls were a hot mess. Lesson learned. I now use a bench scraper when making these curls. Besides baking this cake in a 9-inch springform pan, I’ve baked it in various sizes. I made a two layer version using two 4-inch by 2-inch pans (1st photograph above); and a three layer cake using 6-inch by 3-inch cake pans (photographed below); and I’ve also used an 8-inch round pan. I’m sure a square or rectangular pan would also work well. Thanks Angie! I wanted to redo the chocolate curls but just did not have the time so I had to let it go. The last time I made this cake I used smaller pans (6 inches) to make a taller cake with layers. I just updated the post with a picture of it. Thanks again for your kind words Angie! Looks absolutely lovely! I love chocolate and hazelnuts! Thank you. I too love chocolate and hazelnuts, a perfect combination of texture and flavor. Thanks for stopping by and commenting. Happy Holidays! This is like a bakery- cake! Congrats! I must try the recipe! Thanks so much. I’m glad you like it. Please do try the recipe! There are a lot of steps but its not too difficult. All the best and Happy Holidays! Hi Shanna, thank you! It’s hard to say exactly how long it took because I made the chocolate curls and the candied hazelnuts two days in advance and made the chocolate cake a day in advance. As you may recall, I actually made two cakes since I gave half of the first one away to friends…. Broken up in steps, over a couple of days, making this cake becomes much easier so you don’t have to spend all day in the kitchen baking and putting the cake together. As you need time for the chocolate to melt, then cool I find it’s better to separate the process so it doesn’t get overwhelming. I came across this recipe over 10 years ago. I think I got it from a Martha Stewart magazine. Last night I looked at her website but couldn’t find this recipe. I’m not 100% sure, however I’m going to assume it’s from Martha. So glad you like it! Shanna, I also meant to say that although I made the cake a day in advance, I decorated it with the ganache and put it all together (with hazelnuts and chocolate curls) the morning I planned to serve it. Cakes are magnificent, in any height. When I hear hazelnuts, my knees shake. p.s. I did not see this post in my Reader, I refreshed my follow button. Martine, I don’t see dryness in your chocolate curls. Your photo adds a rustic look that makes it look less bakery and more homestyle. Love it! I’d never heard of a bench scraper until now. Thank you for sharing all the details. Thanks Josephine. A bench scraper is a handy little tool although I only seem to pull mine out when making these chocolate curls! Did you make the triple chocolate mousse cake? We spent Christmas at Jene’s–thus I didn’t have my stand mixer. I am a solemn believer that any attempt to bake should NEVER be made without a stand mixer! I am hoping to try the mousse cake soon though. I will let you know if I was successful. If not, you will have to freeze yours and send it to me! Happy New Year to you and your family! Yes, whipping the cream and chocolate would have been a challenge without a stand mixer. It would have been a great workout though I’m sure! 😉 If I make it again I’ll keep a slice in the freezer for you. 😉 Happy New Year! Oh and I like your interpretation of my cake as rustic looking and more home style. Sounds much better than it just looking dry. Thanks and best wishes for a very happy new year!! !